You can share data sources with individual users or groups within your organization, enabling others to view the data sources (when granted “View” access) or view and modify the data sources (when granted “Edit” access). When you share a modelled data source, the data source from which it was built is not automatically shared. If you want the recipient to be able to access the original data source, you need to share it separately. When you share a data source with an individual in your account, an email notification is automatically sent to the recipient. Learn more about email notifications here. Note: This article explains how to share data sources from your list of data sources. You can also share data sources with groups via the Users section. Learn more here. How do I share a data source? You share a data source from your list of data sources. You can either share an individual data source or multiple data sources. 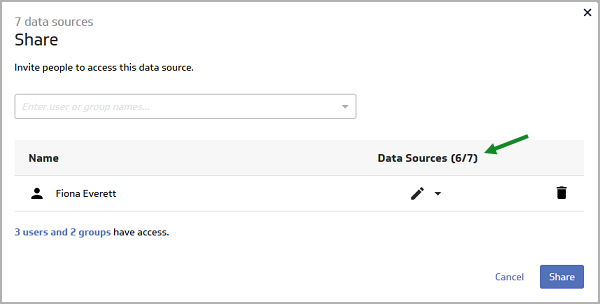 Select the checkbox(es) for the data sources you want to share and click Share. If you select one data source to share, its name displays at the top of the Share window. If you select more than one data source to share, the total number of selected data sources displays. In the Share dialog, enter either a user name or a group name with which you want to share the data source(s). You can either type the user or group name or choose from an alphabetical list of recipients (accessed by clicking the drop-down arrow). Continue adding user or group names as needed. Grant appropriate access for the user or group for the Data Sources by selecting the relevant icon from the drop-down lists (either Edit or View). Note: If you don't have sharing rights for all of the selected data sources, numbers will display beside Data Sources, indicating how many you have the rights to share (as shown below). In these cases, we suggest you contact the owner of the data sources and ask them to upgrade your access. At any time, you can click the link beside access (for example, "3 users and 2 groups have access") to see who currently has access to the data source(s) and to optionally change or remove their access. To apply the changes, click Apply. To return to the Share window without making changes, click Cancel. For more information about managing shared data sources, see this section. After you share a data source, it displays in the user's list of data sources. On the Data Sources page, select a data source from the list. How do I modify access to a shared data source? After you share a data source, you can view, modify, or remove the sharing rights you previously granted to others. Select the checkbox for the data source for which you want to update sharing access and click Share. Select from the drop-down lists to update others' access to the shared data source or click the Remove icon to remove their access. Your permissions, determined by the settings selected for your role. To share a data source you must have the "share a data source" permission associated to your user role. Learn more about user role permissions here. Your access to the data source. You must have "Edit" access to the data source. If you have "View" access only, you will not be able to share the data source with others. The recipient's permissions, determined by the settings selected for their role. Regardless of the access level you are granted by the sharer, you can only interact with a data source according to the permissions associated with your role. For example, as a user, if you are assigned to the default "View-Only" set of role permissions and someone shares an asset with you that gives you editing rights, you won't be able to edit the asset because your role permissions don't allow editing. The level of access granted by the sharer. For example, if a sharer gives you viewing access to a data source and you have a set of permissions that allows editing, you will only be able to view the data source.